Happy Easter everyone! First of all, let me just say that I think this is the first time that I have ever "properly" set a table. And I did it just for y'all! No really, Hubba Hubba is deployed (as usual) so it was just me and kiddo. So here you go! I scrounged up this cute table setting out of things that I had laying around....and of course the nommy things I bought for Easter. 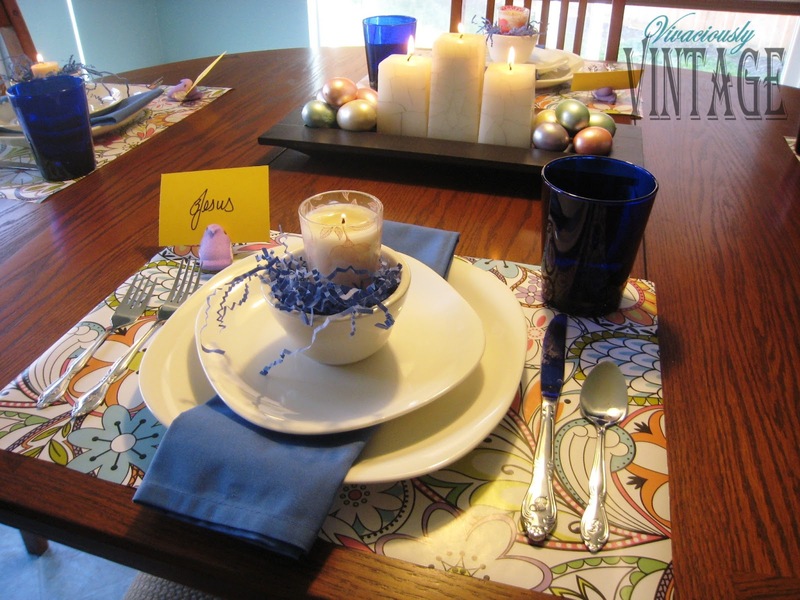 When I bought dishes after Hubba and I got married, I opted for a creamy color thinking that the dishes would go with any holiday or table setting. It's a lot easier to store and change place mats, napkins, etc than an entire set of dishes, in my opinion. The little ramekins I have been gradually collecting from restruants because they match our dishes. Shh... Our glasses, however, I have yet to replace. 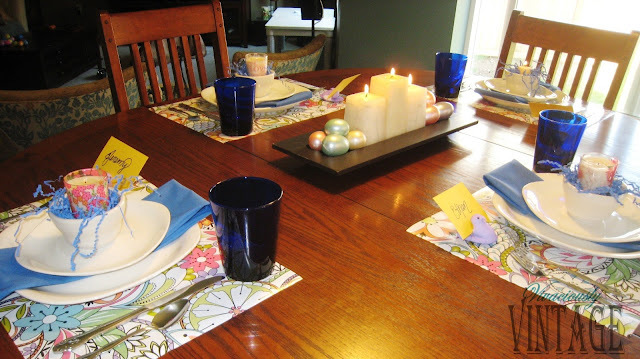 Funny enough, they're blue so they coordinate with my Easter table setting! So on to the extras that really make the table! Those awesome place mats aren't place mats at all! It's wrapping paper that I have been hard pressed to find a good use for - until now! It's the perfect combination of spring colors. While not very durable, they're disposable - and sometimes saving time is better than getting to reuse something! Mine didn't get messed up this dinner, so I'll be saving them for another table setting - or possibly something else! 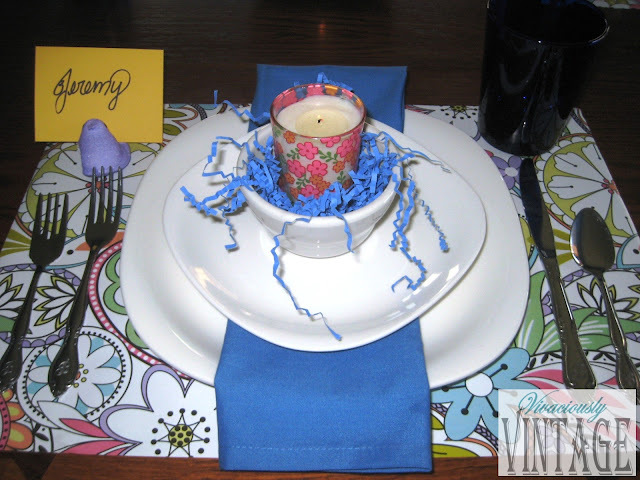 I talked about using food for spring decor here. I have not changed my mind about the usefulness of food (besides in my tummy!). 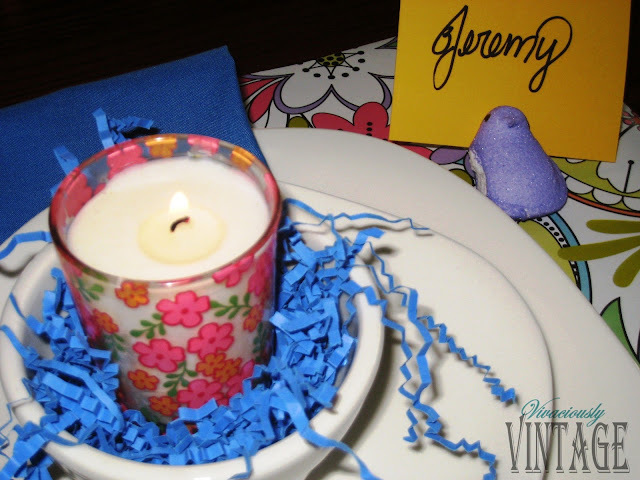 I used peeps as place card holders. I hacked gently cut each peep's head in half and inserted the place cards, which I made from scrapbook paper. I filled the ramekins with leftover Easter grass from last year and topped that off with some votive candles that I had hanging out in the JFR waiting for a purpose. I think my table turned out pretty well for me deciding as I was cooking that I wanted to set the table nicely! I'm still a table scape novice, but I think I'll work diligently on changing that! So how was your Easter? Did you have a pretty table scape? Cute Ansley!! I didn't know Jeremy was out again. Call me!!! !